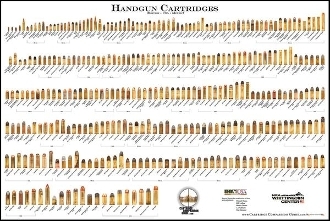 The Handgun Cartridges poster focuses on Handgun cartridges (revolver & automatic) from all over the world which includes Military, Law Enforcement, Civilian and Sporting use. It includes Metric, USA, and British cartridges. The poster contains over 320 Handgun cartridges – all life size (measuring within 4/1000 of an inch). Poster dimension: 24x36 inches. Images are full color on High gloss / High quality 100lb poster paper.